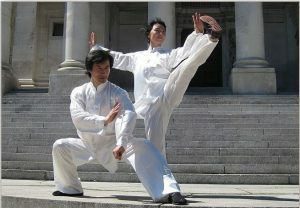 A good friend of Sifu Qui Rong Zhao, Sifu Li and Sifu Lin, are Tai Chi / Wushu masters running a Wushu Academy in Germany. They regularly organize weekend seminars. Some are a full week (Tai Chi). Sifu Lin is a Tai Chi world champion (3x) and Chinese National Champion (8x). A visit will be interesting and instructive. I spoke with Sifu Li and Lin and we are welcome to subscribe to the seminars they organize. Chin Woo does not facilitate these seminars for you, i.e. you will have to arrange it yourself on your own accord. You can subscribe to the DragonCulture seminars by visiting their web-site https://dragonculture.net/. There you will also find the calendar information with all the upcoming seminars for 2017-2018. Tip: For 30 euro you can become a member and get a discount on the workshops and seminars being organized. This will be beneficial if you plan to follow a number of workshops/seminars.